Rafale Deal: Union minister Prakash Javadekar claimed that the previous United Progressive Alliance (UPA) government had stopped the Rafale deal midway for a review in 2012 as it wanted to "bring in" Robert Vadra's close aide Sanjay Bhandari. Amid a political slugfest over the Rafale fighter jet deal, Union minister Prakash Javadekar on Tuesday hit out at Congress president Rahul Gandhi over his "chor" jibe at Prime Minister Narendra Modi and wondered whether the Congress chief's "behaviour" could be called "shameless". Mr Javadekar, who was in Mumbai, said the Bharatiya Janata Party (BJP) government will go ahead with the purchase of fighter jets from France to strengthen the Indian Air Force (IAF). The HRD minister claimed that the previous United Progressive Alliance (UPA) government had stopped the Rafale deal midway for a review in 2012 as it wanted to "bring in" Robert Vadra's close aide Sanjay Bhandari. Robert Vadra is the son-in-law of UPA chairperson Sonia Gandhi and brother-in-law of Congress president Rahul Gandhi. "We also know cuss words, but we have no intention to use them for politics. Congress president Rahul Gandhi used very abusive words against the prime minister. What should we call his behaviour? A shameless one?" Mr Javadekar questioned. "The language used by Rahul Gandhi does not follow any norms of decency, hence, we condemn the use of such language. No matter how many times you spread a lie, it will never become the truth," he said. Rahul Gandhi had on Monday alleged that the country's "chowkidar" Narendra Modi had snatched away money from the poor and handed it over to industrialist Anil Ambani. Mr Gandhi also demanded answers from the prime minister on several issues relating to the Rafale deal and asked him to clarify as to why former French president Francois Hollande reportedly said "we didn't have a choice" in selecting the offset partner for the deal. Addressing reporters in Mumbai, Mr Javadekar said the Rafale deal was being opposed only by Pakistan and the Congress. "Pakistan feels India will become more powerful if we procure the fighter jets, whereas the Congress is afraid that the BJP's power will grow manifold and that is why it is criticising the deal," he said. The Human Resource Development (HRD) minister alleged that the previous Congress government stopped the Rafale deal "which was in advanced stage, for their own (personal) interest". 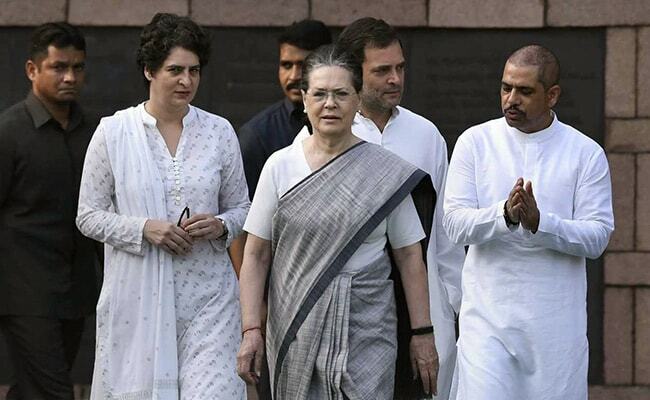 "We have found out that in 2012, the Congress-led UPA government stopped (the Rafale deal) midway and ordered a review (of the deal) because they wanted to bring in Sanjay Bhandari, who is very close to Robert Vadra (Rahul Gandhi's brother-in-law). Sanjay Bhandari is now abroad," he said. The senior BJP leader also highlighted that the current government signed the deal at a cost which was 20 per cent lower than the one proposed by the previous Congress government. "The deal between the two countries (India and France) was already at an advanced stage during the Congress government," Mr Javadekar said. "All scamsters felt protected under the Congress-led UPA government. (Nirav) Modi, (Vijay) Mallya left India now because they are afraid that the BJP government will take action against them," he said. The Union minister accused the Congress of levelling "false allegations" even during the tenure of former prime minister Atal Bihari Vajpayee. "There was no coffin scam," Mr Javadekar said, referring to the allegations of corruption in the purchase of coffins by the then BJP-led government after the 1999 Kargil war between India and Pakistan. "Congress compromised on national security by stalling the Rafale deal at an advanced stage just because Robert Vadra's aide Sanjay Bhandari wanted the offset contract. Congress cannot work without middlemen. This is the difference between them and the Bharatiya Janata Party. The Prime Minister Narendra Modi-government made a government-to-government deal with France for Rafale, in which there was no middleman involved," he said. On the demand of the Congress and some opposition parties for a joint parliamentary committee (JPC) probe into the Rafale deal, Mr Javadekar said the committee will be of no use in view of false allegations. "The Congress has realised that it does not have any future in the forthcoming (general) elections and that is why it is trying to hatch some conspiracy to malign the image of the BJP," he said. The Congress under Rahul Gandhi has launched an unrelenting tirade against the BJP government over the Rafale deal, alleging corruption and violation of rules by the prime minister. It has also accused the prime minister, finance minister and the defence minister of "lying on the issue". PM Modi had announced the procurement of 36 Rafale fighter jets after holding talks with then French president Francois Hollande on April 10, 2015 in Paris. The controversy took a turn last week after a French media report quoted Mr Hollande as purportedly saying that the Indian government proposed Reliance Defence as the partner for Dassault Aviation in the Rs 58,000 crore Rafale jet fighter deal and France did not have a choice.